Medical treatment has improved by leaps and bounds since this simpler time, however, something intangible was lost. Hilton Head Island’s Doctors Care has found a way to bring some of it back. Understand, they are not exchanging fresh baked peach pies for bandages and antibiotics; however, they are practicing a kind of community medicine that marries modern practices and insurance requirements with a more personal family approach. The first Doctors Care was opened in 1981 as a minor emergency medical center in Columbia, South Carolina by a group of emergency room physicians. This urgent and family care provider now has 52 offices with 1,100 health care professionals practicing family care, urgent care, occupational medicine, and employee wellness medicine. 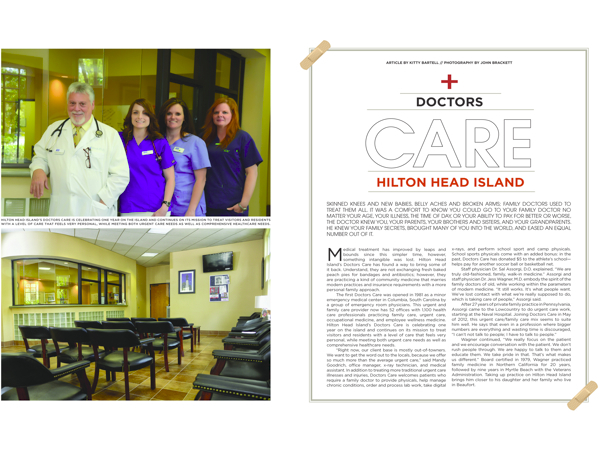 Hilton Head Island’s Doctors Care is celebrating one year on the island and continues on its mission to treat visitors and residents with a level of care that feels very personal, while meeting both urgent care needs as well as comprehensive healthcare needs. “Right now, our client base is mostly out-of-towners. We want to get the word out to the locals, because we offer so much more than the average urgent care,” said Mandy Goodrich, office manager, x-ray technician, and medical assistant. In addition to treating more traditional urgent care illnesses and injuries, Doctors Care welcomes patients who require a family doctor to provide physicals, help manage chronic conditions, order and process lab work, take digital x-rays, and perform school sport and camp physicals. School sports physicals come with an added bonus: in the past, Doctors Care has donated $5 to the athlete’s school—helps pay for another soccer ball or basketball net. Staff physician Dr. Sal Assorgi, D.O. explained, “We are truly old-fashioned, family, walk-in medicine.” Assorgi and staff physician Dr. Jess Wagner, M.D. embody the spirit of the family doctors of old, while working within the parameters of modern medicine. “It still works. It’s what people want. We’ve lost contact with what we’re really supposed to do, which is taking care of people,” Assorgi said. Wagner continued, “We really focus on the patient and we encourage conversation with the patient. We don’t rush people through. We are happy to talk to them and educate them. We take pride in that. That’s what makes us different.” Board certified in 1979, Wagner practiced family medicine in Northern California for 20 years, followed by nine years in Myrtle Beach with the Veterans Administration. Taking up practice on Hilton Head Island brings him closer to his daughter and her family who live in Beaufort. This passionate, hard-working staff takes on medical challenges of all shapes and sizes, from colds and flu to jellyfish and stingray stings. “We see fish hooks stuck in random places, lots and lots of colds, big cuts and wounds, and have even helped get a couple of people to the emergency room with heart attacks,” Goodrich said. “I love it here.” The care continues with a follow-up call to every patient after a visit. “We call you two days after your appointment to make sure you’re okay,” she explained. Those with conditions requiring more emergency-related care are stabilized and given necessary short-term treatment at Doctors Care while an ambulance is called to transport the patient. An appointment is never required, whether visiting Doctors Care for a one-time injury or illness, or more routine care; and with extended hours, treatment is available until 8 p.m. Monday through Friday and until 5 p.m. on Saturdays and Sundays. Serving the local business community, Doctors Care also provides employer health services, including treating Workers’ Compensation cases, pre-employment physicals, and drug screenings. The Hilton Head Island Doctors Care team is the modern day incarnation of the traditional family doctor. Providing comfort and treatment to visitors and residents in a compassionate, skilled, and timely manner, the patient’s needs are met with the latest treatments and technologies, and their questions are patiently answered. A visit to the doctor has taken on a whole new, and maybe a little old, meaning. 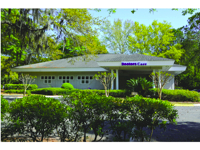 Doctors Care is located at 845 William Hilton Parkway, Hilton Head Island. For more information, call (843) 341-2416 or visit doctorscare.com.